JDP offer a wide range of geotextiles, geogrids, damp proof membranes and gas membranes for separation, reinforcement, filtration and protection. Whilst there are commonly used products for more standard applications, there is also a wide range of products available to offer specific and unique solutions to a range of separation, reinforcement, filtration and protection problems. In these cases please consult JDP for the best solution available to you. Both woven and non-woven geotextiles can be used in the same applications. There is no hard and fast rule that only one type is suitable for one specific application. Selection is dependent on site-specific factors and costs. In typical road and building foundation situations, the most important performance requirements of the geotextile are to provide separation and reinforcement. Consequently, the puncture resistance and tensile strength properties of the geotextile selected are the most significant. In such cases a woven geotextile could normally be selected due to performance and cost benefits. So what exactly is a geotextile? Geotextiles are permeable fabrics made from polypropylene or polyester. Used under the surface they can increase the load-bearing and lifespan of roads, driveways, embankments and drainage ditches. Resistant to soil acids and alkalis and impervious to fungi or rot, they come in two types: Woven and non-woven referred to as Fibre geotextiles. How will a geotextile help me to do a better job? 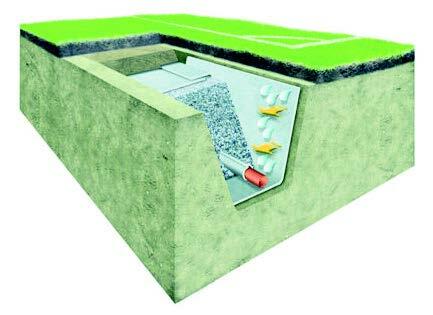 Geotextiles have three key functions: Separation, Reinforcement and Filtration. Without a geotextile, aggregate and subsoil can mix causing excessive settlement, which in return causes rutting. Using a geotextile over the subsoil before laying the aggregate will prevent downward movement as well as the upward pumping of weak subsoil into clean stone. By spreading the load horizontally across a wide area geotextiles can increase compaction of the aggregate base; improving the strength and extending the life of all types of paved and unpaved traffic areas. Geotextiles retain fine particles in the soil while allowing the free movement of water. In this way they can restrict soil from migrating into perforated drainage pipes and prevent them from silting up. Used in stone-filled drainage ditches they provide a continuous and consistent filter and produce a higher quality construction – even better it reduces the depth needed so you won’t have to dig as deep! How can a geotextile save me money? First of all you’ll spend less on materials – the right grade of geotextile will maintain the same load support with less aggregate. This also means you’ll spend less time excavating, and because they give a more durable result it’s less likely that you’ll need to return to repair minor defects. All of this means that a geotextile, far from being an extra cost, will easily pay for itself and more. There’s no need for training or special tools either and it’s so easy to install that your mum could do it! I thought they were just for weed control? Weed control just happens to be one of the added extras that geotextiles give on top of all the other benefits. Why is a geotextile better than a weed fabric? Most weed suppression fabrics are very weak and light. Geotextiles are at least 3 times stronger and more durable too. Try using them on bare soil and covered with mulch or gravel for long-term weed control and moisture conservation. What’s the difference between a woven and non-woven geotextile? Woven geotextiles are manufactured by weaving together narrow strips of film, whilst nonwoven geotextiles are created by entangling plastic fibres or bonding them chemically or with heat. Wovens increase the load capacity of traffic areas by distributing weight more evenly. Nonwovens also do this but combine excellent drainage and filtration to prevent the pooling of surface water. Both have outstanding separation properties to prevent sub-base contamination, which can result in an uneven surface and construction failure.